Cat “thieves” have been warned against feeding their neighbours’ pets after a pensioner was handed an official warning by police for taking in what she thought was a stray. Before feeding the mewling cat at their back door, animal lovers need to check with their neighbours to ensure they are not inadvertently stealing someone’s pet, Cats Protection has said. 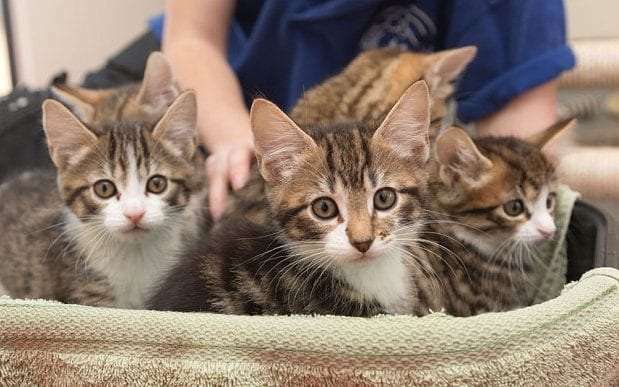 The charity has begun a new campaign to inform cat lovers about whether the animal they are feeding is a stray or not, and to prevent accidental “cat thefts. This comes after a pensioner was visited by three police officers and slapped with an official warning letter – for feeding a cat she thought was a stray. Shirley Key, 79, noticed a skinny black cat in her greenhouse last Spring and fed it for more than a year, as well as buying it toys and paying a £200 vet’s bill. However, after a neighbour complained, she received two separate visits from police officers in marked cars and a written warning accusing her of “cat theft”. She explained: “The cat was skin and bones and very weak, he obviously hadn’t eaten for a while. Eventually I took it to Pets at Home, who asked me to look after it. “They said it had been neglected, and I paid all the vet bills.” She said she continued to give the cat food if he turned up until May this year, when an officer from Kent Police knocked on her door, saying she had been reported for “cat theft”. Miss Key said although she no longer fed the cat, three weeks later, police again knocked on her door in Westgate-on-Sea, Kent. “This time, two officers said they were hand delivering a Community Protection Notice,” she said. The notice said the Miss Key must not “allow any other person’s pet into her property, including outbuildings” or allow anyone else’s pets in overnight. Breaching the notice could have led to an £80 fine, a court appearance and a criminal record. “I felt like a common criminal,” she said. Kent Police have since admitted that the officers were too heavy-handed and should have not given Miss Key the community notice. In a statement, Chief Inspector Rhiannan Pepper said: “A warning was given to a resident in error on May 31 in Westgate following a report of a dispute between two neighbours. A spokesperson for Cats Protection told The Telegraph: “We do hear of people accidentally adopting owned cats. We ask people to check with their neighbours first before taking in a ‘stray’ cat. They also advised looking out for a new cat over time; if a well-fed cat keeps coming back, it is likely it is owned. However, the charity also warned that a malnourished animal may be lost, and could need to be reunited with its owner, so recommended taking any potential strays to a vet to check for a microchip. ← CONGRATULATIONS EVERYONE WE DID IT!! !